Project Management Professional providing solutions with high-value and high-impact results. My creative edge is your project advantage. 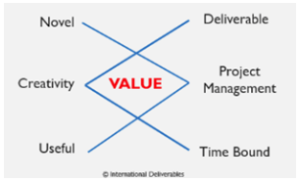 International Deliverables, LLC is recognized as the industry leader in integrating creativity and Creative Problem Solving (CPS) into project management. International Deliverables, LLC is a certified New York State and New York City Women Business Enterprise (WBE) and a certified Federal SBA and SAM registered Woman Owned Small Business (WOSB). As a master facilitator of Creative Problem Solving (CPS) and Project Management Professional (PMP), I combine research based elements of creativity with principles of project management to leverage project outcomes. When these disciplines are intersected an increase in value results. Whether your project is undertaken to create a unique product, service or result, I can help you increase high-value and with high-impact results from inception through completion. The PMP is recognized universally as the gold standard in project management. It has been shown that when companies work with a PMP, more of their projects are completed on time, on budget and meeting original goals. Working with a PMP guarantees you have an experienced project manager responsible for all aspects of project delivery, leading and directing cross-functional teams.